There is little glare or jagged emotionalism in these two sumptuous and lovingly-shaped piano quintets. Each runs to about half an hour. The two works are separated by twenty years and the model, conscious or otherwise, is Brahms - with passing references to Schumann and Mendelssohn. This is the Brahms of the Second Symphony and Second Piano Concerto rather than the growl and grimace of the First Piano Concerto. They make for good rounded listening. The 1897 work dates from the year of Brahms' death and might well have been intended as a tribute to a composer who cast a long and benevolent shadow over Gernsheim's music. There have been a few Gernsheim discs including the four symphonies: 1 & 3 CPO and 1-4 on Arte Nova 74321636352 with the Rhineland Philharmonic conducted by Siegfried Kohler. Other pieces have made it onto CD: the Trios and the Cello Concerto. His Second String Quartet has been recorded by the Mandelring Quartet on Audite 97.503. Oliver Triendl, such a resourceful and musical pillar of strength to the CPO catalogue, has also recorded the Gernsheim Piano Concerto which should be well worth a listen. 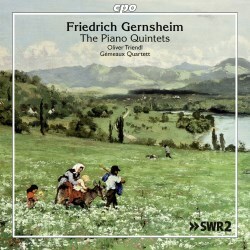 Triendl is central to these two succinctly expressed quintets whether it is the lighter noontide shades of the First or the darker hues of the 1897 work. In fact the Second at times illuminates its smiling way with some delightfully lucent ideas as towards the end of the first movement. The playing of the Gémeaux Quartett (Arisa Fujita, Viktor Stenhjem (violins), Sylvia Zucker (viola), Matthijs Broersma (cello)) complements that of Triendl although there were a couple of moments where I wished the violins had an even lusher tone. I see from the Gémeaux website that it has also recorded the string quartets of the contemporary composer Pierre-Dominique Ponnelle for Genuin. The notes are by Karl Böhmer and these appear to have been adeptly translated by J Bradford Robinson. The sound courtesy of Sudwestrundfunk is forward - excellent. Gernsheim, a German romantic who speaks in confident Brahmsian paragraphs. A correspondent, Peter, has pointed out that there is a Toccata Classics disc of these very works. I should have mentioned it; not a case of studied neglect.